Well, it does have a big canal and plenty of molas, but it was not too hot at all (winter is beginning and Greg lives in the mountains where there is a lovely cool breeze). 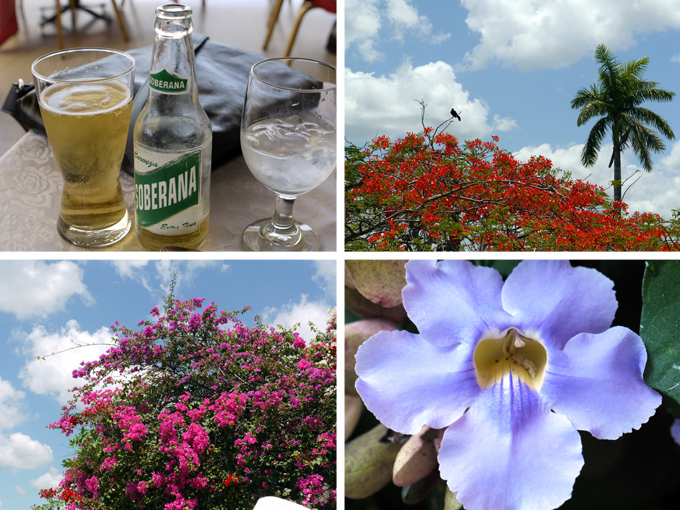 And it is gorgeous, with a huge variety of birds and butterflies and flowers—and beer (people in tropical climates know how to make beer, and you have to love one that includes the word “sober” in its name). Panama City itself is very cosmopolitan, with a gazillion skyscrapers and more going up every second. 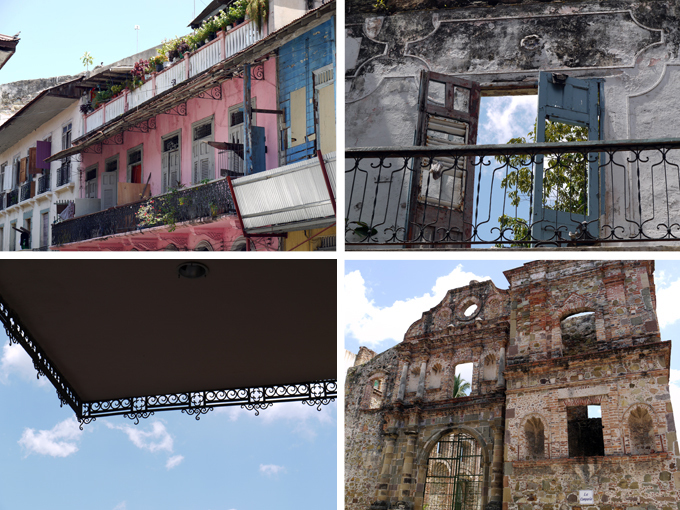 It also boasts a beautiful old section called Casco Viejo which dates back four centuries and is being carefully restored, although I tend to love the old and crumbling bits which have amazing texture and color. It was settled after Morgan the Pirate destroyed the original old city (called Panama Viejo) in 1671, the ruins of which are being excavated. 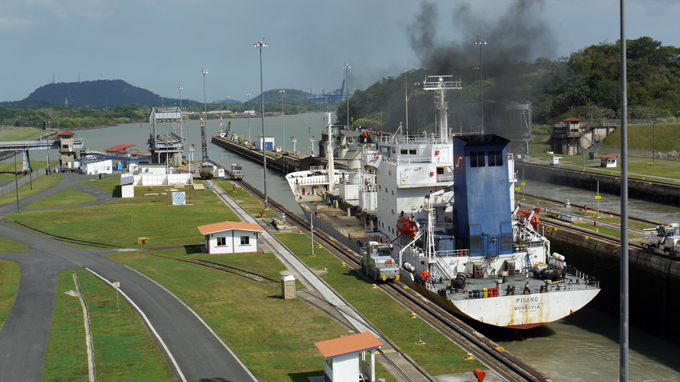 The Panama Canal itself is—as has been said for almost a century now—a miracle of engineering. It still operates in exactly the same way as it did in 1913 when it opened. I will now bore you with the details (illustrated!). Ships enter a set of locks at each end of the Canal (and go through another set in the middle) through which the water level is controlled. 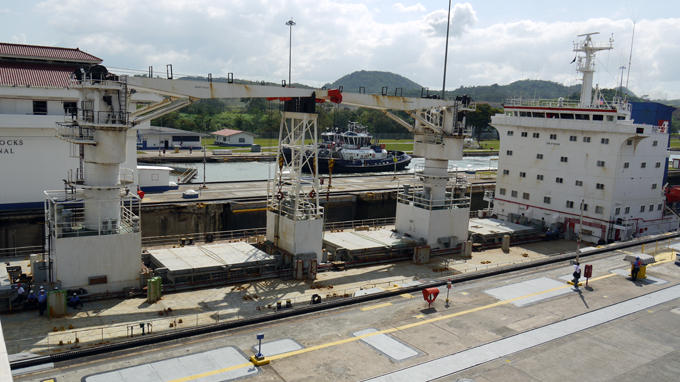 The only locks open to the public are the Miraflores Locks on the Pacific (Panama City) side. Traffic goes only one way at a time: from midnight until noon all ships enter from the Pacific and go through to the Caribbean Sea, and from noon until midnight it is the reverse. 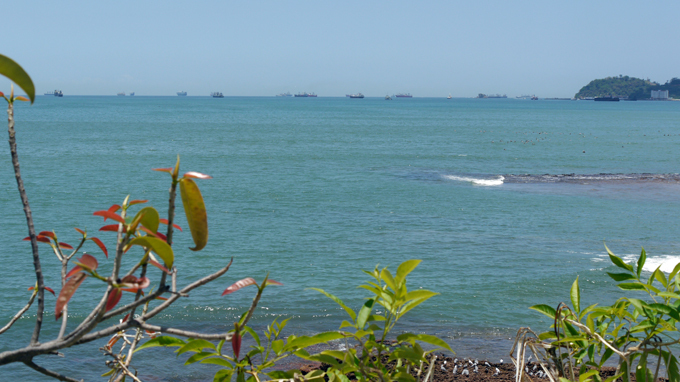 There is always a queue of ships waiting their turn—these are in line to start through at midnight. This empty container ship was coming through from the Caribbean side to exit into the Pacific. Note how high the water level is as the ship enters through the first set of gates (they are open behind it here) from the Canal. Once through the initial gates, the ship waits as the water level goes down to match the level beyond the second set of gates (which is rising at the same time). This happens pretty quickly—no more than ten minutes or so. When the water level on either side of the second gates is equal, they open up and the ship passes through. 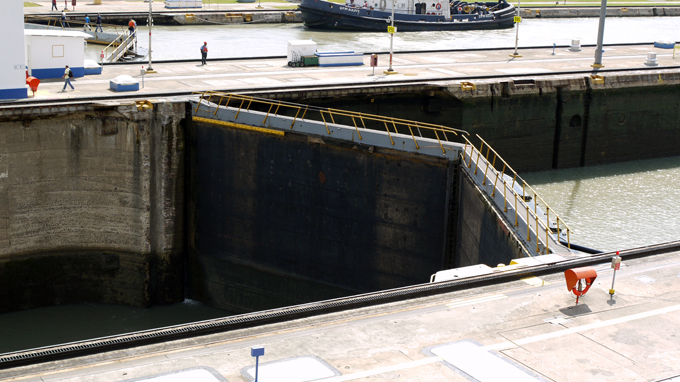 There is very little room for error as you can see—some ships have no more than 60 centimeters of space on each side of the canal as they go through the locks. The little train-car thingies on each side help to keep the ship from drifting and crashing into one of the banks. As ships pass through the Canal they are piloted by men who take over from their regular captains. Crew members apparently look forward to the eight hours it takes to get through because they get the day off. Bye bye, big boat! Once the water level between the second and third (and final) set of gates has been equalized with the water level in the Pacific, they open and the ship goes on through and out to sea for the rest of its journey home. See how much lower again it is below than it was when it came through the second set of gates above? Fascinating. I am really glad to have seen it all in action. There is a lovely restaurant in the visitors’ center overlooking the locks at which you can spend a leisurely afternoon with cocktails and a sumptuous buffet lunch as you watch the activity from a table on the balcony. I naturally found time to take pictures of my favorite subjects: (stray) dogs and children. 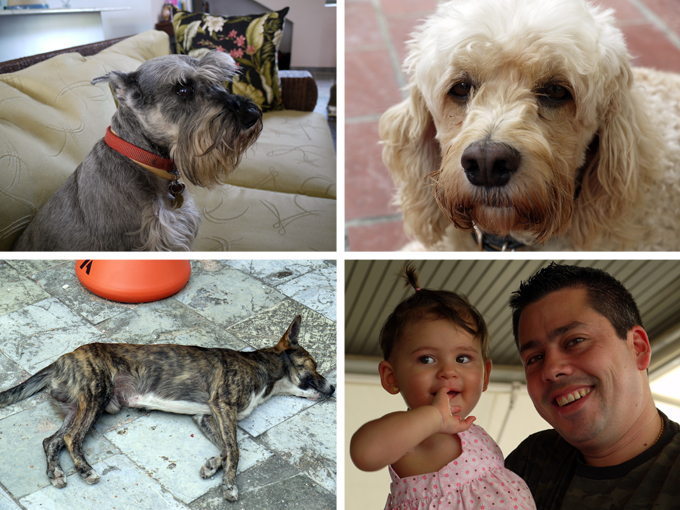 The two not-stray dogs are Abbey, a sweetie-pie miniature schnauzer, and T-Bone, Greg’s spaniel-poodle mix. I hadn’t seen T-Bone in four years but he remembered me and greeted me ecstatically; and both of them gave me lots of love. Greg’s home up in an area called Cerro Azul is beautiful and serene, especially in the fog (actually, clouds) and rain which welcomed me for the first few days. And Friend Greg himself is a creative and hilarious man with a gift for accessorizing on the go. He used to joke with me that the only time in my life that he would let me down as a friend would be when Gemma died. “I’m just going to leave town!” he would say. Since he had left town in any case, I am very glad that he went to this gentle and beautiful country of Panama so that I could see it too when I needed it (and him) the most. *This turns out to not actually be true, but the Canal does have an incredible safety record nonetheless! Posted on April 16, 2011 at 4:05 pm in Everything else	| RSS feed You can skip to the end and leave a reply. You really needed this, Greta – after all you’ve been through in the last few months. 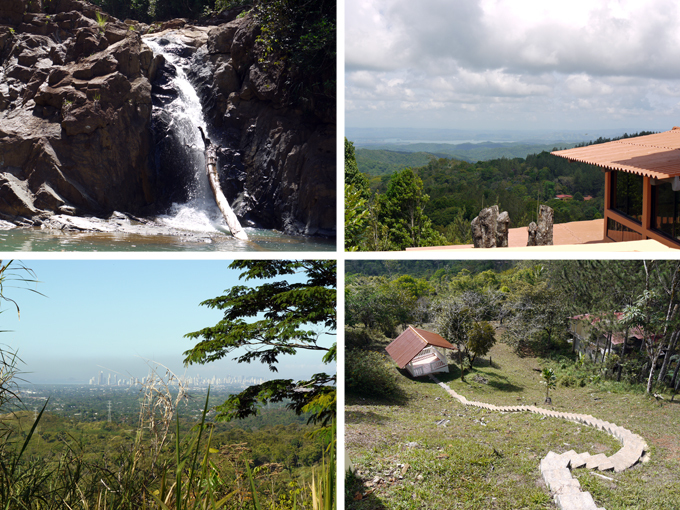 Very happy that you could get away from it all for a week and be in a place as peaceful as Panama, with nature, in all its raw splendour, all around you. And most importantly, one of your oldest and closest friends to be there for you when you needed him most. That is what real friendship is all about. I’m sure you’ve done it yourself but, via this comment, I want to thank Greg and his partner (and his dogs) too. You mean a lot to all of us here, so we also owe them our gratitude for making sure that you had such a lovely time there. 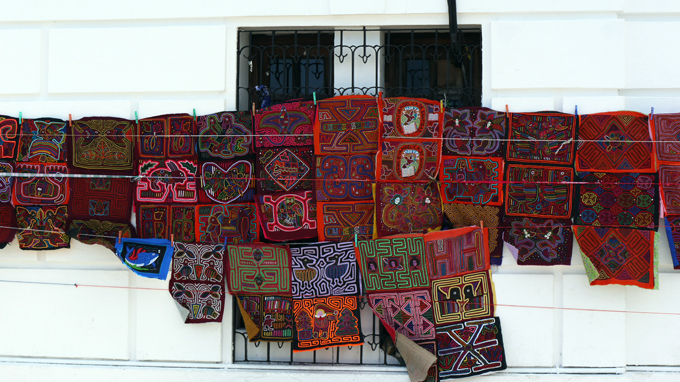 I love those molas. And is that tree with those orange/red flowers the gulmohar tree that you find lined up along Indian roads? (and see very often in Hindi movies :-) ). Yes, that was a flame tree, or flamboyant, or gulmohar :) And there was lots of bougainvillea and orchids and so much more. Very beautiful country, the people are so sweet and laid back too. It’s a great place to relax and enjoy life and I can’t wait to go back! Very nice post. 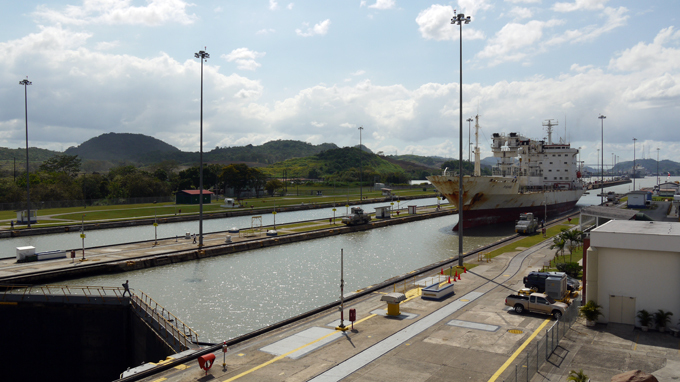 I love it when people say, “Oh, yeah, I guess we can’t go to Panama and not see the Canal, yawn.” And then when they get back they post, “Wow! Was that ever cool! !” And it is. But not to rain on your parade, but the statement: “There has never been an accident in the Panama Canal, ever!” isn’t true.Last year, May 10, 2010, a Norwegian ship lost steering and careened across the channel going aground on the east bank bridge foundation of the Bridge of the Americas. But there has never been a collision between two ships and in the nearly 100 year career of the Canal there have only been TWO DAYS when it was closed to traffic which is quite a record. You know, when I wrote that I thought—I shouldn’t say it (even though it’s what I was told)…either it probably isn’t true or I’ll jinx the poor Canal :D But it is quite a feat to be able to say that it’s only ever been closed twice!!! I guess the daily “take” from passage fees comes to $8 million or so? I am not much of one for engineering etc. but the way the Canal works is just so fun to watch. A miracle of human ingenuity! 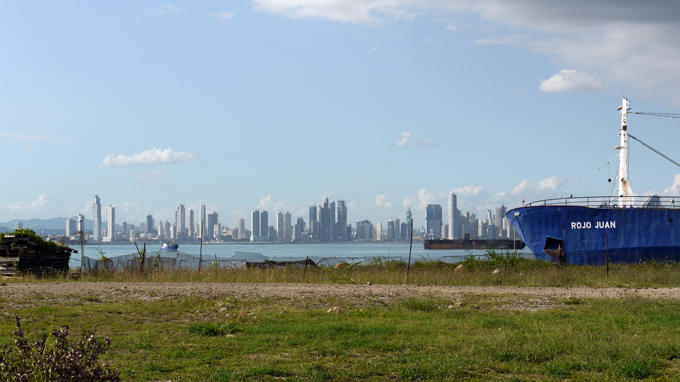 Panama looks seriously beautiful, the colors are like something from a 70s movie, no? I wouldn’t mind some of Greg’s accessories. :) Seems like you had a great vacation. Good for you. Wonderful pictures, Panama looks enticing! You are lucky to have Greg as a friend. I loved all the pictures. You have no idea how lucky I am to have Greg as a friend. He is seriously one of the most amazing people on the planet. What a wonderful post, Greta (by the way, have I ever told you: I invariably type your name as ‘Great’ and have to go back and change it? :-)) Lovely photos, and your explanation of the Panama Canal made a lot of sense. Which says a lot, considering I’m an absolute duffer when it comes to anything even vaguely mechanical. Maybe the next movie I should watch is Tyrone Power’s Suez! Great pictures indeed. 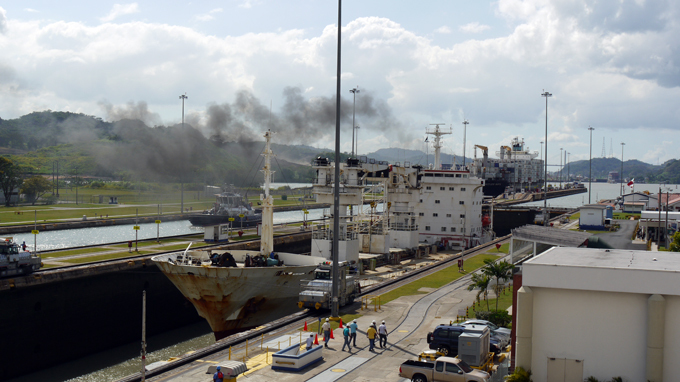 I will show these pictures to my daughter to explain about Panama Canal. Your pictures explain the workings of the canal more coherently than any textbooks ever can. And what superb dogs and sceneries. Oh the dogs are so so superb. The scenery too :) Bet your daughter will be more interested in the dogs than the Canal! Gorgeous! Colorful and instructive. Thank you for sharing your trip. You are welcome, it was great fun. The world is so full of interesting places! I just wish travelling wasn’t such a flog these days. Welcome back! Thanks so much for sharing your beautiful pictures. I am glad to be back :) Also glad you enjoyed the photos. That is a great compliment coming from you (on both counts) :D Thanks! Loved reading about sus vacaciones. I swear I could smell the sea salt in the air! Mountains and oceans – you had the best of both worlds! …it was only a week!…. That is because we have become addicted to you! We cannot do without our daily Greta byte! But we are willing to suffer withdrawal cramps – you can now double up as a travelogue writer! Looks very nice memsaab. And since this is a bollywood blog I thought I would mention your friend reminded me of Om Prakash. Any one else see the resemblance? I think the resemblance is more to Shammi in his middle career. Ha ha ha! I must say that I would never have thought of that! Lovely photos and very informative. Thanks for sharing. Lovely pictures! My best friend Ron and his partner Patrick just visited there last month, also, along with travleing around much of south America. They had a wonderful time. Could you email me please memsaab? Wow! awesome. Looking at the pictures, it inspires me to visit Panama too. 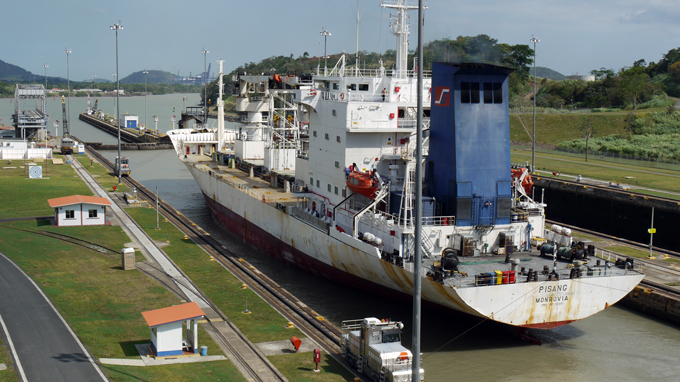 I also would love to personally witness how the action goes in the Panama Canal. Great article memsaab!